This class represents general abstract filter objects. Definition at line 21 of file filter.h. Definition at line 16 of file filter.cpp. Check whether this filter is an attachable filter. Reimplemented in Botan::SecureQueue, and Botan::DataSink. Definition at line 52 of file filter.h. Notify that the current message is finished; flush buffers and do end-of-message processing (if any). Reimplemented in Botan::Base64_Decoder, Botan::Hex_Decoder, Botan::DataSink_Stream, Botan::Base64_Encoder, and Botan::Hex_Encoder. Definition at line 46 of file filter.h. 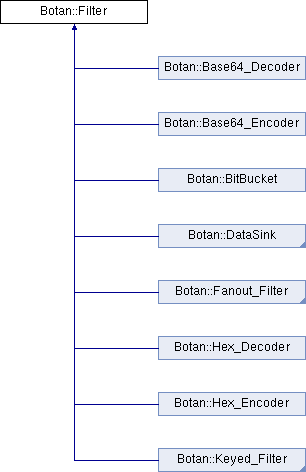 Implemented in Botan::Fork, Botan::Hex_Decoder, Botan::Base64_Decoder, Botan::DataSink_Stream, Botan::Chain, Botan::Cipher_Mode_Filter, Botan::BitBucket, Botan::Hex_Encoder, Botan::SecureQueue, and Botan::Base64_Encoder. Definition at line 27 of file filter.cpp. References end_msg(), start_msg(), and write(). Referenced by Botan::Base64_Encoder::Base64_Encoder(), Botan::Hex_Encoder::end_msg(), Botan::Base64_Encoder::end_msg(), Botan::Hex_Decoder::end_msg(), Botan::Base64_Decoder::end_msg(), Botan::Hex_Encoder::Hex_Encoder(), Botan::Cipher_Mode_Filter::valid_iv_length(), Botan::Hex_Decoder::write(), and Botan::Base64_Decoder::write(). Definition at line 65 of file filter.h. Definition at line 71 of file filter.h. Definition at line 81 of file filter.h. Start a new message. Must be closed by end_msg() before another message can be started. Definition at line 40 of file filter.h. Write a portion of a message to this filter. Implemented in Botan::Fork, Botan::Base64_Decoder, Botan::Hex_Decoder, Botan::DataSink_Stream, Botan::Chain, Botan::Hex_Encoder, Botan::Base64_Encoder, Botan::BitBucket, and Botan::SecureQueue. Referenced by send(), and Botan::Pipe::write(). Definition at line 107 of file filter.h. Definition at line 106 of file filter.h.